Steven Gillis Agency State Farm Team (L-to-R): Jack Piddington, team captain Allan Boshell, Cory Piddington, Allysa Miller, Marcus Burnett and Josh Legg. 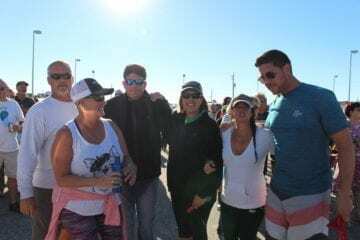 The Outer Banks Association of REALTORS® (OBAR) held its 22nd Annual Surf Fishing Tournament on Friday, October 19, 2018 at Jennette’s Pier. This year the 6-person Steven Gillis Agency State Farm team took first place with a total of 103 points. 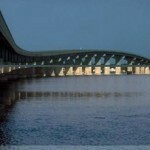 “I am proud of their effort and Captain Allan Boshell,” Gillis said. Boshell was awarded $500 for his team’s first place finish. Gillis also sponsored breakfast for the event prepared by Stack ‘em High. The breakfast sandwiches were eagerly snatched up as the teams made their way to the beach for the 7:15 a.m. start time. OBX AC ‘A’ Team: (L-to-R) Joey Koerperich, team captain Stu Baldwin, Brian Forbes, Dave Gumm, Bob Rickabaugh, and Alan Jones. OBX AC “A” Team scored second with 81 points. 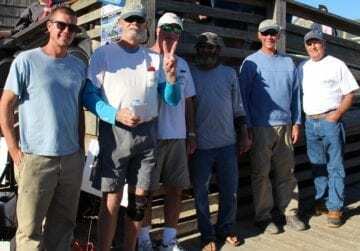 Captain Stu Baldwin, with the Outer Banks Anglers Club, and his team received $250 for their second-place finish immediately after the tournament. The Wells Fargo Originator’s led by Team Captain Kelly Bergenstock, with Wells Fargo Home Mortgage, placed third at the event. Bergenstock and her team chose to donate their 3rd place winnings of $125 back to OBAR Scholarship & Disaster Relief Funds. This year Aimee Pitts, of Wells Fargo Home Mortgage chaired the committee of six OBAR members that planned the entire event. This was her second year as Chair. “The Fishing Tournament is always a great day and the core committee is filled with many talented individuals who have the common goal of a fun and successful event that raises money for both the Scholarship and Disaster Relief funds,” Pitts said. “It truly is rewarding to see so many individuals come together for such great causes and the community as a whole is so incredibly generous that it makes the planning that much easier,” Pitts said. Wells Fargo Home Mortgage was also the Beverage Sponsor of the event, handing out free drinks to thirsty fishermen throughout the day, and provided several items for the fishing buckets including towels. Shane Cook from Prime Lending, and Vice Chair of the committee, donated a Yeti Fishing package worth $500 for the grand prize. Only 250 tickets were available for the grand prize awarded at 6:30 in morning on the day of the tournament via Facebook Live to Cola F. Vaughn, with Cola F. Vaughn Realty. Prime Lending also sponsored the morning coffee provided by Front Porch Café, a BBQ lunch by High Cotton BBQ, and provided items for the fishing buckets. The Wells Fargo Originators (L-to-R): Danny Hedgepath, Dana Hedgepath, Rob Petty, team captain Kelly Bergenstock, Tricia Bonday, and Daniel Caro. The tournament closed with an awards ceremony and raffle prizes. Generous local businesses donated the raffle prizes, including Ace Hardware, who donated buckets for the team’s fish, and TW’s Bait & Tackle who provided six Shakespeare Alpha fishing rod combos for the popular “pick a pole” raffle prize. This event has long been a fun occasion with comically named teams and community support. “The Outer Banks Association of REALTORS® is dedicated to helping others,” said Lori Brooks, 2018 OBAR President and owner of Coastal NC Realty Group. “The event raised almost $6,000 which will be divided between our Disaster Relief and Scholarship funds,” Brooks said. “My heartfelt thanks to all the teams that participated, the committee who helped to organize everything and all our sponsors to help make this tournament fun and meaningful for the people who benefit from the proceeds. I am looking forward to next year, but until then, ‘Tight Lines! '” Brooks added. The annual surf fishing tournament benefits the Association’s scholarship and disaster relief funds. The scholarship fund has helped send 129 local high school seniors to college. 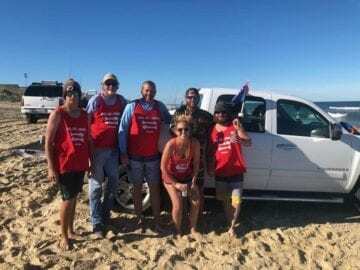 Monies from the disaster relief fund, available to anyone living in the Outer Banks, recently helped locals affected by flooding during Hurricane Michael.